Warminster, Bucks County - GRAND CLOSE OUT! The Villas at Five Ponds II is an elegant resort community served by an exclusive private clubhouse with world-class amenities, and overlooking the lush greens and rolling fairways of Five Ponds Golf Course. Each villa home offers single-level living designed with you in mind! Enjoy the luxury of an elegant home with minimum maintenance, now and for years to come. Each home includes designer interiors with state-of-the-art kitchens, volume ceilings, luxurious bedrooms and baths, spacious master suites and an oversized two-car garage. Entertain lavishly within the open, dramatic layout, or enjoy a lovely summer evening on your new patio or deck. The clubhouse offers a rich addition to your community lifestyle. Residents can take advantage of the facilities for parties, gatherings and planned events in the Ballroom with attached caterer's kitchen. Stay fit in the health and fitness center featuring all the newest equipment for aerobic and strength training. Dive into the heated indoor pool which is open year-round. Meet with friends in the card room to play Bridge or Poker, or head to the lounge for a round of Billiards. The Library/Business Center offers a prime location for meeting with clients. Outdoors, the clubhouse has even more to offer including spectacular terrace and shaded veranda overlooking the freeform pool, a championship tennis court and a basketball court. The manicured grounds feature jogging and walking paths surrounding a picturesque pond. In addition to these many clubhouse amenities, Five Ponds Golf Course offers challenging golf for every level. Located in historic Bucks County, The Villas at Five Ponds II is just minutes from the Pennsylvania Turnpike, Route 611, and other major routes. You'll be close to everything, while enjoying shelter from traffic and noise in this beautifully landscaped enclave of quiet streets and preserved open space. Come and see for yourself - only a few homes remain! 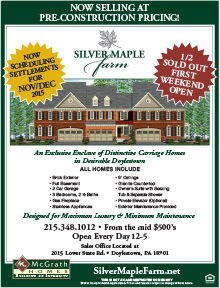 Don't miss this beautiful Warminster, PA age-qualified community from the Upper $300's. Only a handful of homes remain! In March 2007, McGrath Homes teamed Up with "Extreme Makeover: Home Edition" to build a new home for one deserving family in Levittown, PA.